The price of Bitcoin shot higher on the news that Blackrock, the investment tycoon, has set a working group to see if cryptos have a potential. 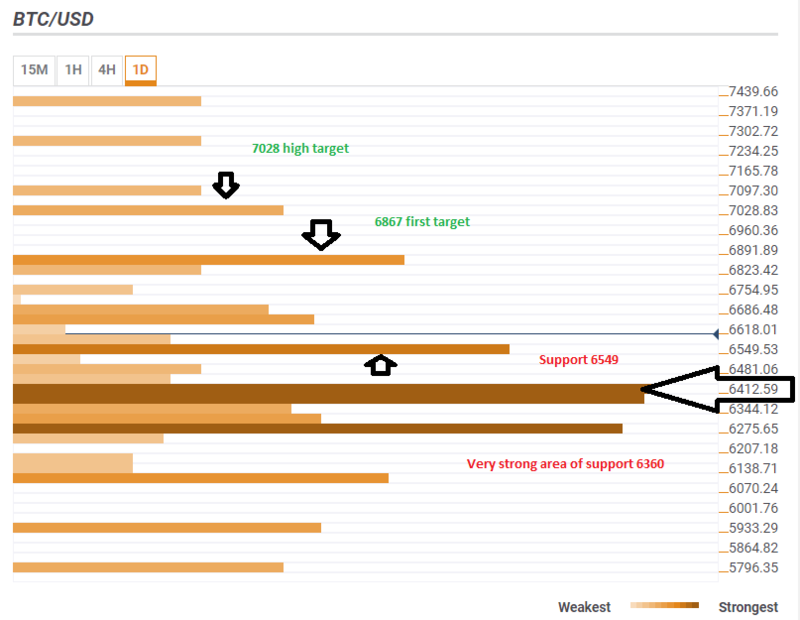 BTC/USD broke above key resistance levels that now turn into support. The Technical Confluence Indicator shows that BTC/USD is well supported at $6,549 which is the convergence of the Fibonacci 61.8% one-week, the Simple Moving Average 5-1h, the Fibonacci 38.2% one-month, and the Bolinger Band 15m-Middle. Even stronger support awaits at the $6,360-to $6,412 area. Here we see a congestion of the Bolinger Band 1d-Middle, the one-day high, the SMA 100-15m, the BB 1h-Middle, the SMA 50-4h, the SMA 200-1h, the BB 15m-Lower, the SMA 200-4h, the SMA 5-4h, the Pivot Point one-day Resistance 1, the Fibonacci 23.6% one-day, the Fibonacci 38.2% one-week, and the SMA 10-4h. The fact that BTC/USD broke above such tough resistance indicates it has momentum. So where next? $6,867 is the confluence of the one-month high and the Bolinger Band one-day Upper. $7,028 is the Fibonacci 61.8% one-month, and only very few meaningful lines are waiting above.